The customer relations landscape is now evolving day by day. Without even noticing it, customers are making less effort, solving problems on their own and using easier options to find the answers to their questions. New applications, innovative services, artificial intelligence and connected mobile devices are giving them greater power. The trend is gathering pace, and successful, market-leading organisations are jumping on the bandwagon. Technology is constantly enhancing customer relationship management, and organisations are taking steps to align the customer relations conducted by algorithms and robots on the richer and more demanding human relationship. The time has come to reconcile digital interfaces with human interaction, customer experience and user experience, augmented customer relations and the new capabilities given to customer-facing employees. When customers talk, they are heard by connected devices. When customers express themselves, their feelings and opinions are immediately taken into account in organisations. Customers now deal with staff who are capable of establishing an enhanced, augmented relationship. 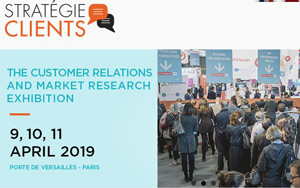 The 2019 Stratégie Clients show is the only such show in Europe to provide a survey of the customer relations sector, now extended to include customer experience in all its forms. Our annual event has become a key forum for discussing the technologies and issues at the heart of customer relations. The show’s steadily growing pool of exhibitors will present disruptive innovations, spanning customer relations from the point of sale to distance selling and from face-to-face to self-care. Industry best practices will be discussed in the many plenary sessions and workshops on offer this year.